Investment managers need a modern operations solution that is automated, efficient, and scalable. A web-based solution for core operational needs. 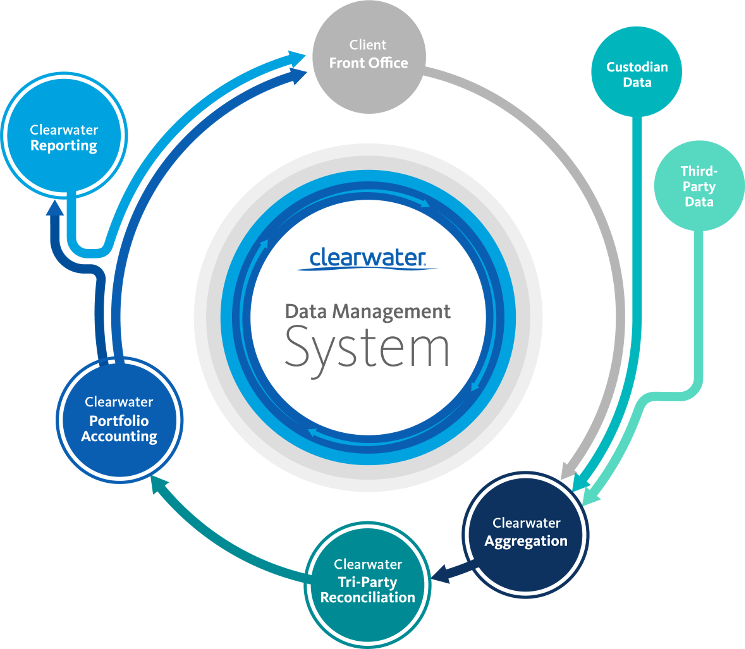 Clearwater automates many of the data-related challenges investment managers face so they can focus on the things they do best. In-house reconciliation systems and processes are manually-based, and are inherently inefficient and unscalable. We love that Clearwater reports give us the ability to customize, filter, and sort reports exactly how we want them at the click of a mouse. And because of the daily data aggregation and reconciliation, we know that these reports are accurate. As AUM increases, daily operations functions grow more complex and disjointed, and investment managers lose data access and control. As CIO, I can come back from a conference or client meeting and have an idea of where everything's positioned and where we need to focus our time. Clearwater gives us that high-level clarity. John Huber, Chief Investment Officer, Prudent Man Advisors, Inc.
Clients and prospects have complex portfolio needs, yet investment manager solutions aren’t equipped to handle complex asset classes. Clearwater allows us to strategically scale and accommodate our new client growth, as well as provide our current clients with a compelling reporting solution. Clearwater’s ability to easily and effectively report on large, sophisticated portfolios provides another layer of efficiency for Beacon Pointe, and truly aligns with our driving principle of ensuring that our clients’ best interest is the force behind everything we do. Investment managers rely on a variety of systems and data sets to meet their business needs, but integrating those systems is difficult and requires inefficient manual workarounds. The Clearwater system has effectively standardized the delivery of accounting data, portfolio performance, and investment policy compliance for our firm. Performance must be tracked according to strict guidelines, a process that is inefficient, difficult, and often error-prone. Clearwater has been a fantastic tool for simplifying our processes so we can spend more time focusing on our clients and not spend all our time figuring out how to get reports to work. Outdated software is difficult to update and dependent on inefficient manual processes, so operational costs increase as AUM grows. Clearwater has the ability to continuously provide updates, change as rules change, and grow with the firm—all automatically—meaning we don’t have to alter our processes every time something inevitably changes. Gaining access to custodian data and maintaining those connections is difficult, time-consuming, and costly. The beauty of Clearwater is that everything is in one place. We have multiple custodians, so having all that data in one customizable system makes a huge difference. Software support is a key component of any technology system, but support for investment manager systems is often reactive, expensive, and a burden to operations teams. Clearwater truly acts like a partner. They are very client service-focused and flexible when we have any requests. We definitely had high expectations for the system and they have delivered on them. Investment managers must comply with a variety of regulatory bodies. Regulations frequently change, but accounting and reporting systems are slow to adapt and difficult to update. Not only is Clearwater responsive to our questions, but they are true insurance industry experts. They proactively stay abreast of the most recent NAIC guidance and ensure that their clients know the most important information, and that their solution is updated to address any changes before they take effect. With Clearwater we are never playing catch-up. Clients and stakeholders expect accessible and easy-to-consume reports and statements, but reporting systems are often inflexible, hard to integrate, and limited in format. One thing we hear over and over from our clients is how happy they are with the level of detail they get with Clearwater, and how quick Clearwater is to respond to any questions or requests. Jeffery Sims, CPA, Executive Vice President & Director of Insurance Investment Management, Sage Advisory Services Ltd.
Clearwater’s web-based solution integrates key operational functions into a single, unified platform. J.P. Morgan Asset Management’s top priorities are to provide clients with investment solutions and excellent service. Clearwater Analytics has been our trusted partner for investment accounting and reporting services since 2007, and together our firms are committed to delivering outstanding outcomes for clients. Clearwater’s automated data aggregation and analytics allows us to closely monitor compliance and risk daily, across our accounts. We’re automatically noticed when an issue arises, so we always know we’re well informed about the state of our investments. I had done accounting for FAS 115-2 before using an Excel spreadsheet, so I know how difficult it is. Having a system capable of handling FAS 115-2 requirements saves us three to five hours per relationship, per month. That’s huge, not only in terms of the time saved, but also for eliminating potential human error. Download our survey report and see how you compare to your peers.